This excursion includes a trip to the foot of Terektinsky edge. 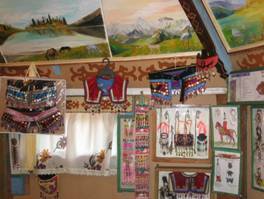 Here you may get acquainted with Alai culture, visit ethnographic museum and make photos in national clothes. There is an opportunity to climb up the place named "Crow's Stone" where you can see Belukha mountain (if the weather is good). This excursion includes both sport and educational leisure.